Last Saturday, April 21st about 30 neighbors and kids came out to tidy up Winnemac Park as part of the 47th Ward's Clean and Green day. The ship-shape park just needed a little detailing but we still managed to fill a large garbage bin with bags of debris and weeds. A big thanks to neighbors Karen Kolb and Elizabeth Mankowski who coordinated and promoted the event. 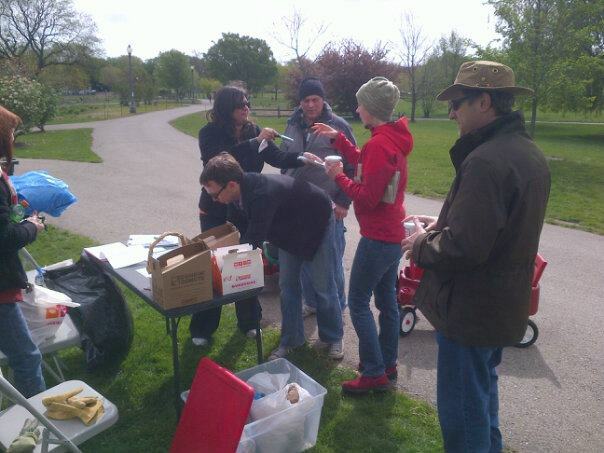 Winnemac Park Neighbors provided coffee and a check-in desk. Thanks to Alderman Pawar and 47th Ward's Dara Salk for stopping by and bringing donuts! We look forward to regular clean-up day events throughout the year in the park. There are also other opportunities to help with the park's beloved prairie plantings, paths and fields. Check out Square Care and register to work on several projects around Winnemac Park and Chappell school this Sunday May 6th 2012.